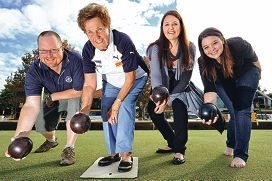 President David Lee said Claremont Bowling Club memberships had been reduced from $250 to $50 a year. Mr Lee said the fee restructure introduced last month could help boost numbers on their Bay View Terrace green and at the bar. ‘To a lot of people, especially semi retired ones, money makes a bit of a difference and we feel the cheaper fees would attract people to us,’ he said. Mr Lee said Perth pennants seemed to be ‘dying’ in lower grades. ‘When I first started there, we had four Saturday pennant teams and five Thursday teams,’ he said. ‘We don’t have a Thursday team anymore. Mr Lee said some of the loss from the reduced fee would be covered through a $1 increase in green fees. He said the club also served as a community hub for the Claremont. ‘If Claremont’s going to be the hub of the western suburbs, then we’re putting our case forward that Claremont Blowing Club should be the hub of the bowling clubs in the western suburbs,’ he said.